Professor Eric Miller is optimistic about finding a solution to gridlock. He moderates U of T Engineering’s upcoming BizSkule event: The 3rd Urban Revolution – Re-thinking the Future of Transportation on Oct. 29 (Photo: Roberta Baker). Frustrated with your commute? You’re not alone. Vancouver is Canada’s most congested city, according to a recent traffic index from mapping titan TomTom, with residents delayed an average of 87 hours a year on their 30-minute commutes. 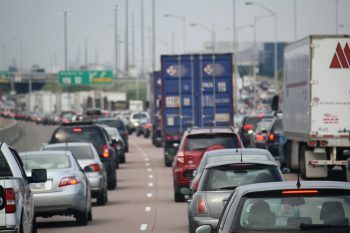 Toronto placed a close second, with the average commuter losing 83 hours in limbo each year. On Oct. 29, U of T Engineering’s keynote speaker series, BizSkule, will feature a panel of industry experts to discuss solutions that will redefine urban travel in the coming decades. 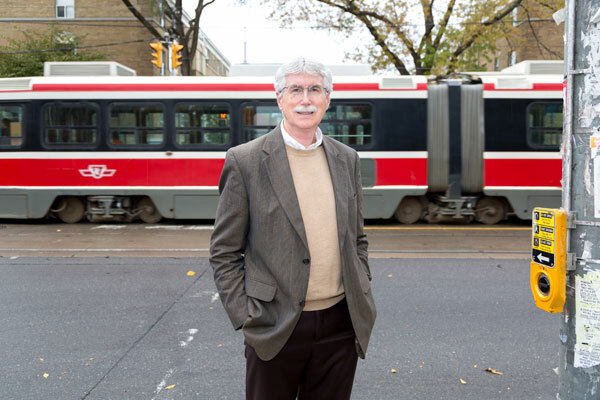 The network-friendly event titled The 3rd Urban Revolution – Re-thinking the Future of Transportation, will be moderated by Professor Eric Miller (CivE), transportation expert and director at the University of Toronto Transportation Research Institute. U of T Engineering’s Jamie Hunter sat down with Miller to discuss the future of travel and the technology that’s going to bring change. Why is it important that we’re having a discussion about the future of urban travel now? As anybody living in Toronto knows, we are faced with huge challenges. And a lot of that has to do with the fact that we haven’t built enough transit or taken the problem seriously enough. But it also reflects that the city is growing, we’re under huge pressures and the conditions of travel are changing. We have to respond to that. You might argue that the traditional approaches haven’t served us as well or at least we haven’t made as good a use out of them as we can. Another reason is that technology—information technology in particular—is changing the possibilities for travel and even the definitions of how we supply transportation services. The smartphone, even though it’s a communications device, is revolutionizing transportation. We can get real-time information at our fingertips that can be used to make informed, rational decisions about the best way to get from here to there. But that’s just the starting point. These apps create all new business models for the transportation industry. And on top of all that we have autonomous connected vehicles—cars that’ll drive themselves and talk to each other—coming down the pipe. There not here yet, but they are going to be. In the BizSkule event description, it mentions that “complete mobility” services will redefine urban travel. Can you expand on that? Mobility is a challenging word because people tend to think of it as mobile communications with your smartphone and apps. For transportation people, mobility means moving from place to place. “Complete mobility” integrates both of these. You have a smart transportation system, which is as much an information communications system as a physical movement of people and goods system—a marriage of the two. By “mobility” we are talking about moving people, but thinking about it in a more holistic way, where you might drive your car someplace, leave it, take transit, pick up a car share, drive it back to where you parked your car in the first place and drive home again. The mixing and matching of modes and services is, potentially, quite interesting. So the “complete” really refers to getting you through your day in a very holistic way and taking advantage of communications and different transportation services and reconfiguring those services as needed. What do you hope that people take away from the BizSkule event on October 29th? A sense of excitement about the field and a sense that there are opportunities out there as a student, a professional or an investor. With the current [municipal] election campaign, we’re so bogged down with news about transit investments and how to pay for it and congestion on the roads—and those are all very important and useful discussions that I’ve spent a lot of time involved in—but I think it’s very easy to feel depressed about transportation and that there is no hope. But there really are opportunities for us to fundamentally change things. It is a brave, new world out there for us—hopefully in a good way. But we have to grab it, we have to jump on it, we have to be innovative. It’s a message for Toronto, Ontario and Canada—if we’re not doing it, somebody else will. We’re not the only ones who have discovered complete mobility. It’s a market opportunity, it’s an academic opportunity, and we have to grab it. View participant bios and register for this event.